At last year's Mobile World Congress, HTC and Under Armour announced the Grip, a fitness tracker that would never appear on store shelves. HTC scrapped the product to work on something better—its words, not ours. At this year's CES, HTC and Under Armour are back to show us what better means. The two companies have partnered up to produce HealthBox, a three-part product for monitoring your health and fitness. The trio consists of a scale, a fitness band, and a heart rate monitor. The UA Scale, UA Band, and UA Heart Rate all have Under Armour branding, but HTC has produced the hardware. The Scale measures your weight and BMI. It's wi-fi connected and supports up to eight users. The Heart Rate goes around your chest during workouts. The Band is meant to go around your wrist all day long, where it will do the usual activity tracking job of counting steps and gauging your sleep. Under Armour handles the software front. You manage everything from the UA Record app already available in the Play Store. As for the HealthBox, it will go on sale on January 22nd. The full kit is available for pre-order from HTC or Under Armour for $400. That, mind you, is more than you would spend on an existing scale, activity tracker, and heart rate monitor from Fitbit, Runtastic, and others. But this is an integrated experience, and that's worth something. LAS VEGAS, CES – January 5, 2016 – Today, HTC and Under Armour unveiled UA HealthBox™, the world’s first connected fitness system that measures, monitors, and manages the most important drivers of health and fitness – sleep, fitness, activity and nutrition. 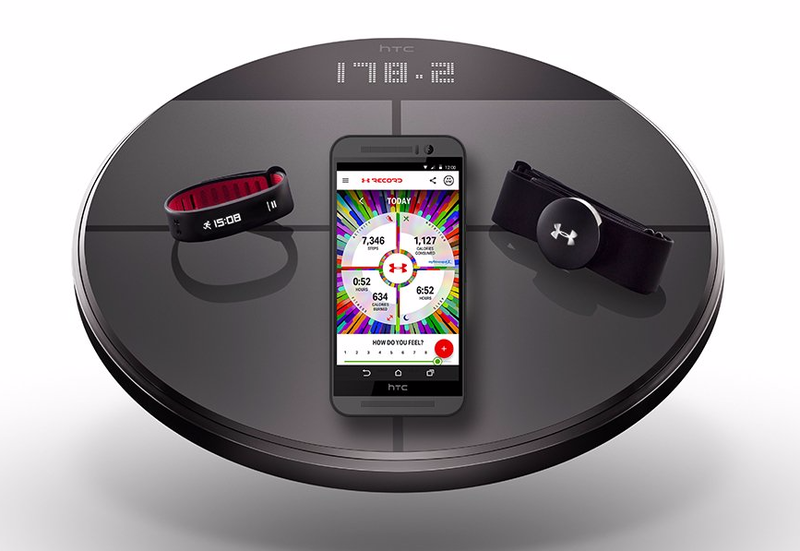 Designed and manufactured by HTC and powered by UA Record™, UA HealthBox includes a fitness band, heart rate monitor and a smart scale that all connect seamlessly with UA Record to provide insights that empower individuals to improve their health and fitness. The new UA Record is available for download from the Google Play™ store and App Store. UA BandTM is designed to be worn all-day, every day. It tracks daily activity, workouts and sleep. All day activity capture allows you to set a daily goal and track progress on the band. UA Band utilizes a seamless exterior shell with a display that is discreetly hidden under an outer layer allowing the technology to disappear when it is not in use. Designed with athletes in mind, the band offers an advanced workout mode with a display that stays on during the workout, as well as an LED that indicates heart rate zone when paired with UA Heart Rate. UA Band comes in black with a red textured underside to allow for moisture wicking. UA Heart RateTM is a compact heart rate monitor with an innovative micro snap technology designed to make it undetectable during workouts. The chest strap and removable sensor helps individuals monitor intensity and train smarter. 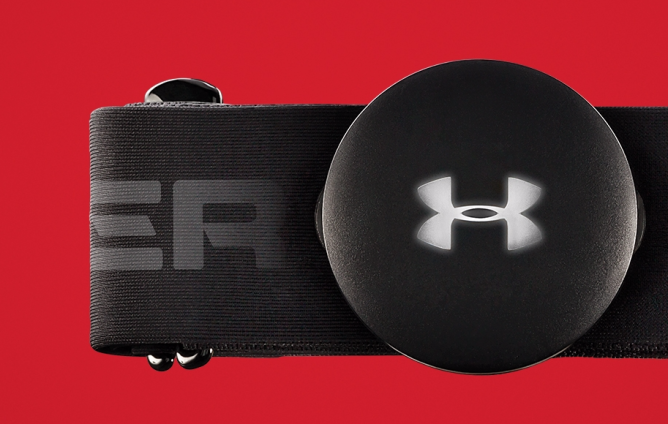 The UA Heart Rate was created to provide an accurate calculation of calories burned. Combined with the UA Record app, UA Heart Rate allows you to customize your heart rate zones. UA ScaleTM is a beautifully crafted, Wi-Fi enabled scale with an iconic circular design. The scale utilizes a sheet of glass with advanced conductive paint technology that enables weight and body fat percentage readings. The hidden LED display behind the glass makes technology invisible when not in use. The scale can support up to eight users and syncs with the UA Record app for individuals to view trends with weight as part of their overall dashboard. UA Scale comes in black with a red textured underside.